The fourth S ession of the Open-Ended Intergovernmental Working Group (OEIGWG) of the United Nations Human Rights Council was held in Geneva from the 15th to 19th of October. Violations of human rights and the rights of peoples and nature have become inherent to transnational corporations operations. But at the international level there is no binding rule for corporations on Human Rights. For this reason, this WG has been created to elaborate a meaningful binding treaty to regulate the activities of transnational corporations (TNCs) and other business enterprises with respect to the violation of Human Rights. 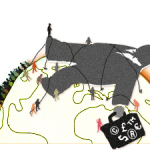 The Global Campaign to reclaim peoples’ sovereignty, dismantle corporate power and stop impunity (Global Campaign), an international network integrated of hundreds of social organizations and movements, actively participated in this fourth session. The Global Campaign has been committed from the beginning of this process, not only with the creation of the mandate of the Working Group for it to elaborate a binding treaty with respect to the TNCs and their follow-up, but also with the elaboration of a draft Treaty that was presented last year to this WG as a way to contribute to the construction of the definitive Treaty on TNCs and Human Rights at the United Nations Organization. Please see here. We share here the Declaration of the Global Campaign for the closing of this 4th session of the Working Group, which highlights some key elements for the elaboration of a meaningful instrument that allows those affected to have access to effective justice. See here.